You've probably paid close attention to the color of your living room walls and spent hours picking out the backsplash for your kitchen, but have you put any thought into your stairs? If you think your staircase is simply a tool to get from one story to the other, you're missing out on a great decorating opportunity. In many homes, the staircase is one of the first things people see when they walk through the front door, so why not make it eye-catching? We can't think of a better way to return after a long, hard day at work than being greeted by these bright blue and yellow stairs from Pufik. We love the faux carpet runner look created by the deep blue block coloring. Plus, the deep color is a great way to hide marks and dirt without a lot of elbow grease. What's happier than ombre? If you've already tried the ombre wall trend, these blue stairs from Mommy Shorts will take the look to the next level. We love the idea of transforming our boring staircase into a sea-inspired oasis that will make us excited to start the day. Though it takes a little bit of an artistic eye to get it right, a few test swatches can help you master this look. 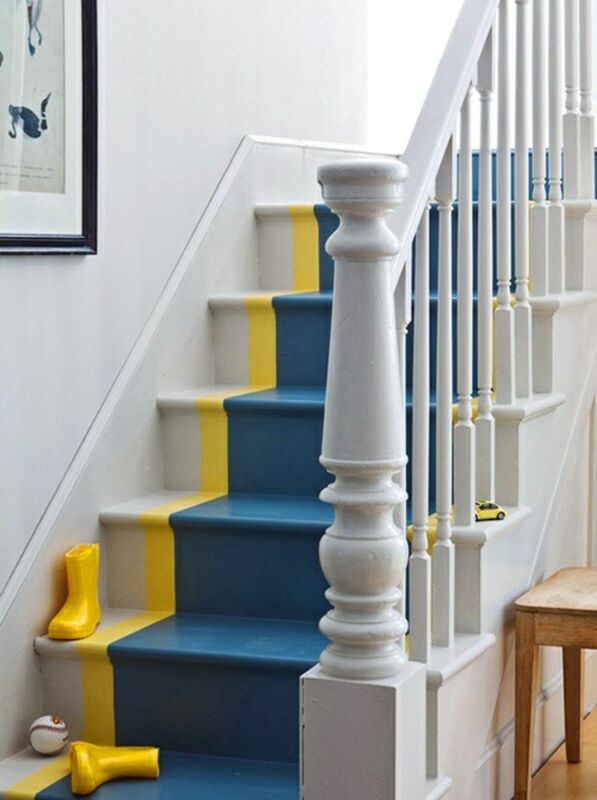 Painted stairs don't have to be bold. A fresh coat of paint can transform your staircase without a lot of money. These two-toned white and brown stairs from In My Own Style are proof that painted stairs work in any home. Blogger Diane ripped out old carpet and refreshed her hardwood stairs with a little paint and wood stain for less than $25. This rainbow stair look from bfarhardesign may not be for the faint of heart, but it sure is stunning. If you're the type of decorator who gravitates toward colorful design, you'll love the idea of splashing bright, bold colors on your stair risers. Calling all Pantone lovers out there: Bloesem Living featured these stunning rose stairs emblazoned with each color's code. Think you're the biggest color fan? You may even want to update your stairs every time Pantone releases their color of the year. We're all about black-and-white color schemes so it's no surprise we're obsessed with these stairs from The Vintage Round Top. The stark black, white and natural wood style blends seamlessly with the modern living space while helping to break up the white accents. If you're all about vintage, pre-war style, these distressed stairs from skonahem are right up your alley. The deep gray color adds dimension and depth, while the distressed surfaces lend a vintage, shabby chic feel. The best part? Making new wood look old is an easy DIY. Pink is the one color that sometimes has a difficult time "proving itself" as a solid player in the design world. But these candy pink stairs from Michael Graydon take our breath away, and remind us that pink truly can be the star of home's decor. Since only the tops of the stairs have been painted, the use of pink doesn't overwhelm. Searching for a painted stair idea that will truly stand out? These black-and-white chevron striped stairs from Amber B Design are one-of-a-kind and simply beautiful. We love how easily the chevron look blends with the neutral wood stair tread. Recreate the same vibe with thick painter's tape. There's just something about these black-and-white stairs found on Pinterest via Lovika that we can't get enough of. 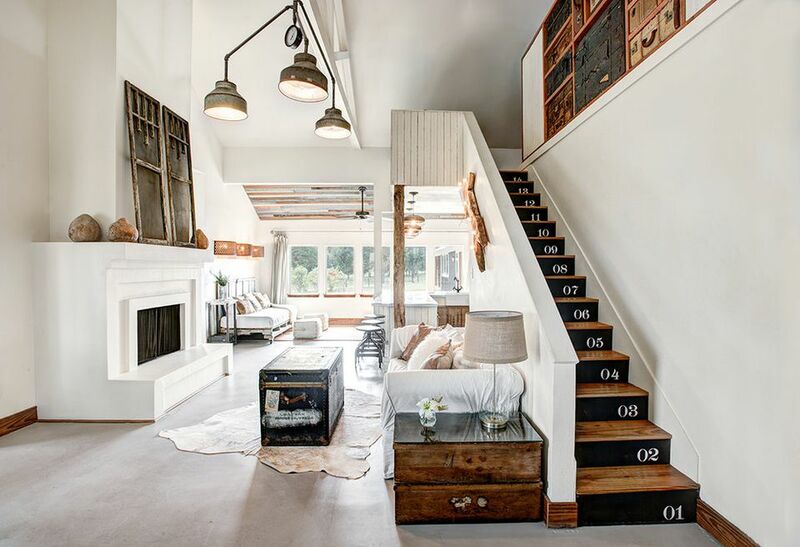 Chic and modern, these painted stairs also give off a whimsical and free-spirited feel. This is a great way to sprinkle in some shapes and patterns and add a touch of intrigue to your home decor. Though these stairs from Raw Edges Design are actually part of a storefront, they're giving us major home decor inspo. Here, wood blocks have been painted various shades of pink and arranged to create an eye-catching chevron design. If a wild bold ombre or chevron stripe just isn't your thing, these subtle, modern stairs from Maison de Pax are a beautiful alternative. They may not be a crazy bright color, but the crisp white and black contrast adds dimension and gives off a luxury feel with little effort. We wouldn't have pictured neon green stairs in such a formal space, but this beautiful staircase from Sour Jones proves it can be done—and look stunning. The pop of color on the riser adds a brightness to the foyer without a lot of natural light. If you're ready to dive right into the painted stair look, why not start with something as bold as green? No matter the season, corals and peach colors work wonders and add a spunky, unique flair to any style of home decor. These bright peach stairs from arseniclace give off such an easy, happy-go-lucky vibe, especially when paired with this fun greenery wallpaper. These gray stairs from Kammys Korner are subtle, classic and beautiful. If your stairs are looking a little worse for wear, a fresh coat of paint and a little elbow grease can make them true centerpieces once again. A carpet runner can be nice, but these nautical-inspired stairs from theothersideofneutral prove you can create the same effect with paint. Stick to the same guidelines you'd use when selecting a carpet runner, and you can swap out your "runner" for a lot less money than real carpet. If you have a small space, a wide staircase can look bulky and oversized. These half-white stairs from _three_little_birds are the perfect solution. By splitting the stairs in half with paint, it creates an illusion of a narrower staircase that works well with the rest of the space. Here's another rainbow stair idea, this time from modern_house_nashville, that makes our heart stop. We love the matte paint used here—though the rainbow colors are bright and bold, the matte look creates a slightly more subtle and vintage feel that works in any home. There are many reasons why a carpet runner is a good idea—it adds texture and reduces slips and falls, especially in homes with active children. If you want the best of both worlds, these stairs from Bright Green Door prove paint works just as well on a carpeted stair as it does on a naked one. Pale pink and olive green have been a trendy decor pairing for a few years now, and these stairs from Remodelista make us want to jump on the bandwagon. The blush wall and the deep green stairs work well in the otherwise all-white space while adding a bit of character. Unless you're a trained artist, creating elaborate murals on your stairs may be out of reach. These gray stairs from kos.home use both paint and self-adhesive wallpaper to create a designer look. It's easy to find budget-friendly wallpaper that will create a luxury feel without a lot of money. Already love the way your stairs look? You can still mix things up by adding a coat of paint to your banister, as seen in these stunning stairs from kimbahills. We love how the bold teal banister matches an accent door in the entryway, creating a cohesive look. What Are the Best Flooring Options for Aging in Place? Concrete Works in Commercial Kitchens—Can It Work in Yours?